Did you think this post was about birds? Chickens don’t migrate, where would they have gone? No, this post is about one of my favorite edible mushrooms, the chicken mushroom. I found the first one of the year yesterday! 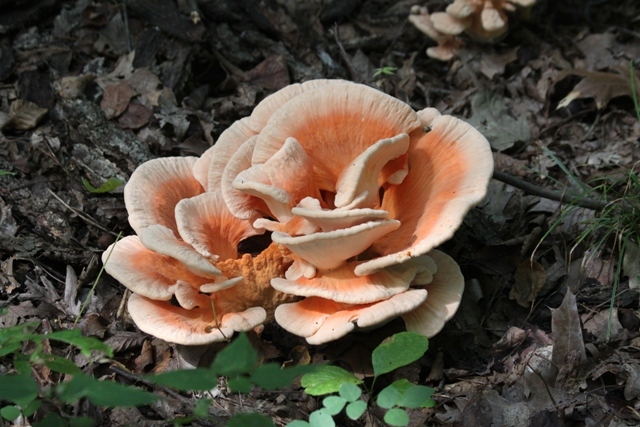 There are two species, known as Laetiporus cincinnatus and Laetiporus sulfureus. 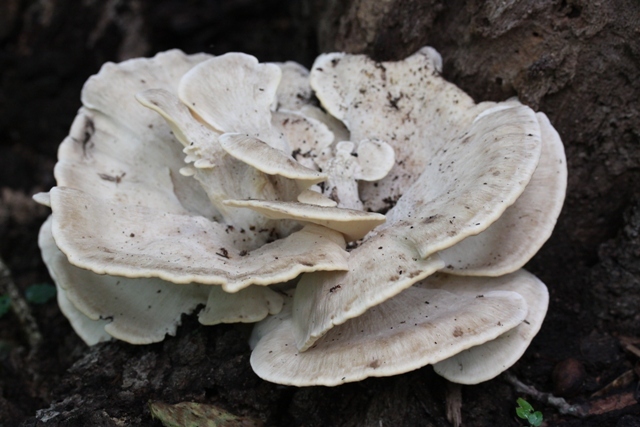 L.cincinnatus grows on the ground, typically near the base of a tree, and has a pearl white underside. L. sulfureus grows on the trunk of a tree and is sulfur colored underneath. From here on out, I will only be talking about L. cincinnatus because it is far more tender and delicious than the other one, although they are both rated as “choice” edibles. Like all mushrooms, they need to be cooked before they are eaten. Don’t do what the moron in the above picture is doing, he’s a professional! Yeah, that looks nothing like a bird. 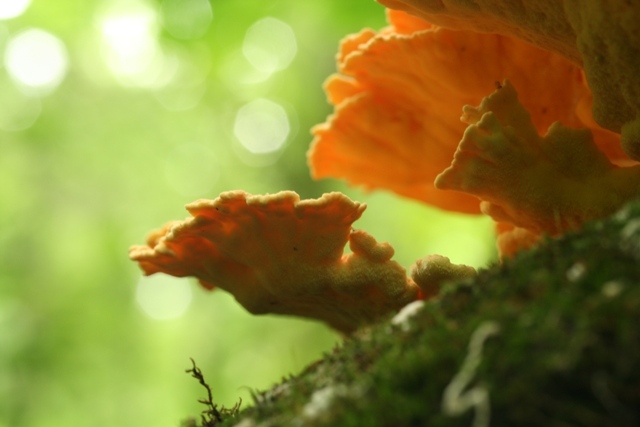 The reason for the name is because this little gem of the forest floor happens to have the exact texture of chicken. No, really, it freaks some people out. I have personally prepared this mushroom as a chicken and rice dish but without the bawk-bawk style chicken and with the fungal variety instead. Upon serving the dish, I had two incredibly irate vegans yell at me for trying to serve them chicken. They could simply not believe that that the little chunks of slightly fibrous white mixed in with the rice wasn’t the flesh of some plump little yardbird. I never did convince them, but thankfully they quickly ran out of energy. For novice mushroom hunters, this is an easy one to look for. Since it is a polypore type shroom, it has no poisonous look-alikes. All the other polypores just have the texture and flavor of rubber. Some people who are a little chicken crazy have convinced themselves that other polypores were actually just oddly colored chickens and eaten them against my own advice. In one instance I was informed the next day, rather sheepishly, that the gray “chicken” was too tough to even chew. I only tease him every few months about this, I’m nice like that. This is called Berkley’s Polypore, it is clearly not a chicken mushroom. I will stress the standard line, do not use this post as your only source to ID any mushroom. Look in two books, etc…. There is so much mythology about mushrooms out there, it drives me crazy. contrary to popular belief, the vast majority of mushrooms will, at worst, give you a stomach ache or simply not taste good. Plants are just as dangerous. Look up “cardiac glycoside” and then tear that cultivated foxglove out of your flower beds…. Artsy mushroom photo…yeah, work it. Oh, and don’t say “but I don’t like mushrooms”, I won’t hear of it! Three groups exist: animals, plants and fungi. So, saying you don’t like mushrooms because you don’t enjoy those flavorless button mushrooms or because someone gave you a mushy portabello is akin to saying you don’t like ANY plants because your mom forced you to eat cabbage laced with those damn caraway seeds (vile things!). 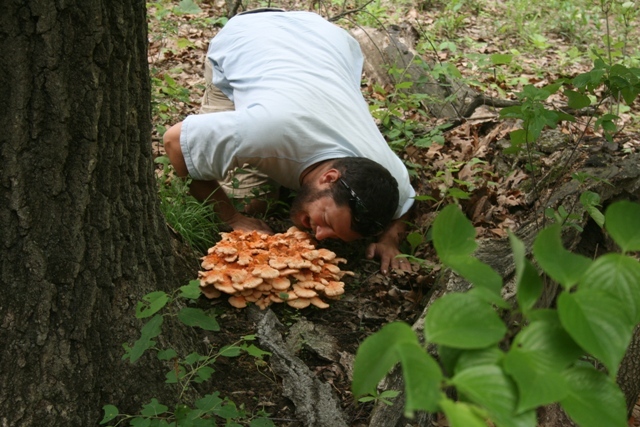 Come on, try your hand at fungal foraging. The flavors of wild mushrooms are as expansive as any other group of food, plus you get the enjoyment of picking it yourself. 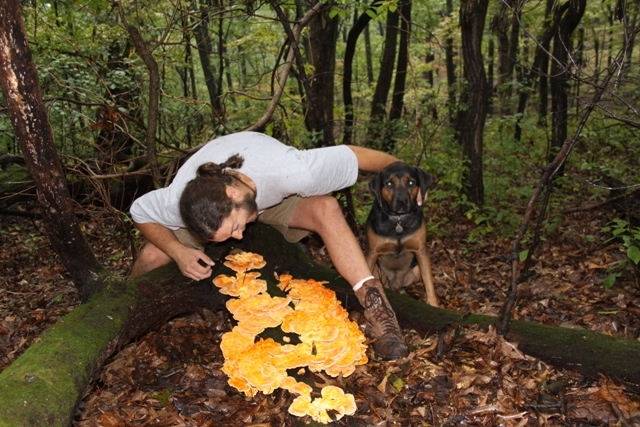 This entry was posted in Other stuff and tagged Chicken, Cook, Edible mushroom, Fungus, Home, Laetiporus, Missouri, Mushroom, Polypore. Bookmark the permalink. 1 Response to Chickens Have Returned!! You forgot to mention that they are beautiful. They look like flowers. Thank you for the photos and the good info.